Brace yourself for a massive try on session! 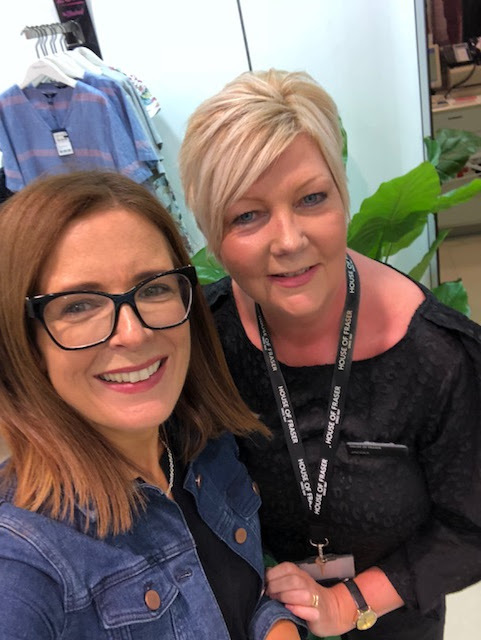 I went into House of Fraser Belfast today to try out the Personal Shopping service as I'm always being asked about it. It's a completely free service that you book via a call to the Belfast store (also bookable online) and you can chose the type of consultation you want, e.g. wardrobe refresh, occasion, so that it's tailored to your requirements. 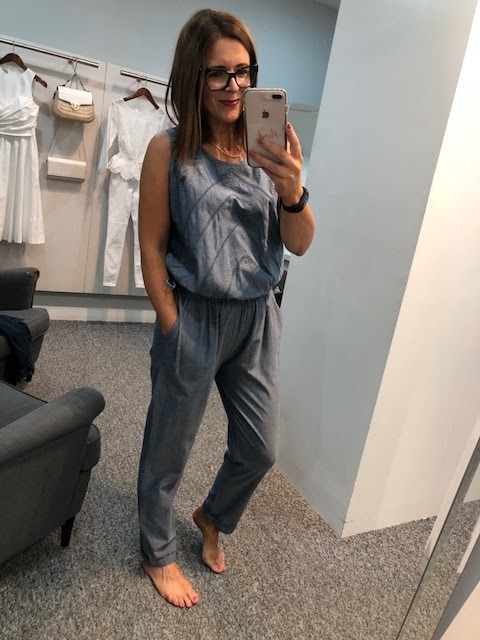 I chose the wardrobe refresh with the remit of affordable casual pieces for summer that can be dressed up or down and I have to say that Jacqui got it spot on. I'm asked why go to a personal shopper whenever I'm constantly in the shops and know what I like but I think every woman should go to a stylist at least once a year and with a complimentary service like this, why wouldn't you? Because having another person dress you is excellent for challenging you if you've got into a rut when it comes to your style. 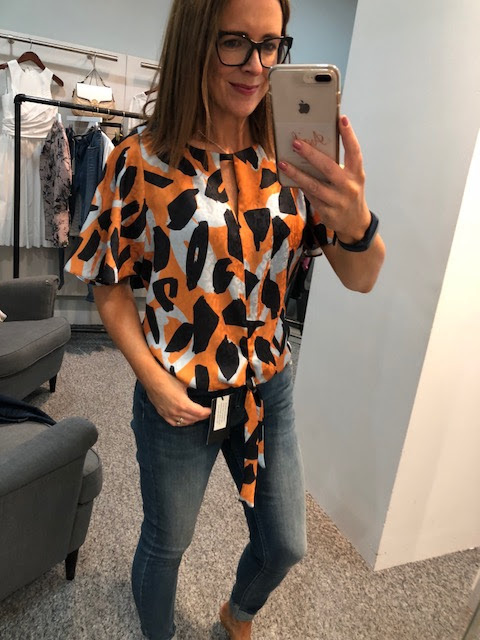 Not only does a personal shopped know the shop stock inside-out, they challenge you to try colours, shapes and styles that you might never have tried out yourself and they will help you integrate these new pieces into your wardrobe. The main benefit of the service though is the fact that you get a massive private dressing room for 2 hours with armchairs, mirrors and a cup of coffee. Such a relaxing way to shop, away from the hustle and bustle. So once I'd had my coffee and chat with Jacqui, I was ready to start trying on starting with a dress that looked like nothing on the hanger but was fantastic on. Very All Saints and reduced to £33 this weekend as part of the HOF Blackout Event (normally £55). Bad start as I forgot to take a picture...duh but it will feature on a blog post very soon and trust me, it looks better on me than it looks on this model. Then a Maison De Nimes dress with a racer back and gorgeous handkerchief hem. Looked great with a denim jacket. I felt a bit bare on my top half but loved everything else about it. 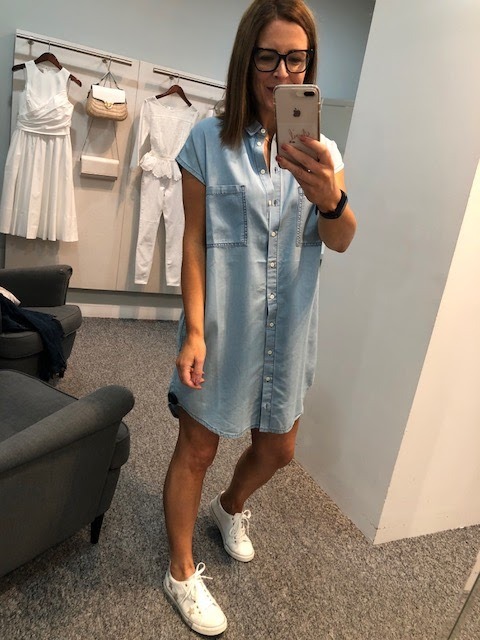 Then a couple of denim dresses, shorter length on me as per my efforts to get the pins out a bit this summer....I've decided after 45 years that they're not as bad as I thought they were! This first one is made from a gorgeous lightweight tencel material. Hung so beautifully. Same jeans again, different top, this time a kimono style top. Loved the print and it looked great open or closed. A couple of jumpsuits now and this label lab one wasn't something I'd have ever chosen to try on yet it looks fab! Though this next denim one was a more flattering fit I think. It looked unimpressive on the hanger but was great on - and it has pockets! Next up and this Maison De Nimes skirt was an immediate hit - even before I tried it on. I love maxi skirts but this is even nicer for having a tie detail on the waist and slits up each side to keep you cool. I paired it with the Label Lab racer back vest (linked above). Another gorgeous dress, this time from Label Lab. A great length on me - I'd add a tan leather belt to nip in my waist but it's a great shape unbelted if you're more apple figured than me. Label Lab Bamboo Print Drop Waist Dress - reduced to £36 this weekend! and now for my favourite outfit of the session, and I need to give a massive shout out to these Label Lab jeans first. They are UNREAL....genuinely the best jeans I've tried on in ages. Proper high waisted, gorgeous soft denim and a really nice subtly distressed wash. Also a great length - they have an unfinished hem and I've turned them up but they would work really well on a longer leg than mine. Worn with a fantastic basic v-neck t-shirt from Label Lab which is nicely loose and has some shoulder detail that makes it look a bit more special. Well reduced this week. and topped off with a Linea jacket in a gorgeous shade of orange. I tried this jacket on in cream the last time I was in so I knew the fit would be great. Love the colour so much. and this fab bubblegum coloured cold shoulder Biba top - LOVED this...can you tell from my face? And here's the woman herself - Jacqui. I had a lovely morning with her and she really worked hard to pull me tons of looks in just 2 hours. I tried on more than I've shown here - but I was changing so fast, I didn't always get usable photos! I the end I bought the grey mesh dress, the maxi skirt and the jeans and t-shirt. Finishing with what I wore today - getting the legs out as I mentioned above. This Next dress I got last year in the sale was perfect for keeping me cool after all that trying on! Hope you enjoyed my try on and remember the Blackout event runs online and in-store until Sunday. Disclaimer : This try on session was part of my monthly collaboration with House of Fraser though I wasn't required to blog about it - just to share on Instagram. But as it was a #ad on Instagram, I need to tell you that here! I was gifted a voucher with which I bought the Jeans & Skirt. I paid for the grey dress and t-shirt myself. Some of my links are affiliate links which means that the brand knows that you've come to their website from here and they may pay me a tiny commission if you buy something and keep it. This modest income goes towards the running costs of this blog so I really do appreciate every click!